Find out how to write for us here. You can attack enemies with a punch throughout the game. 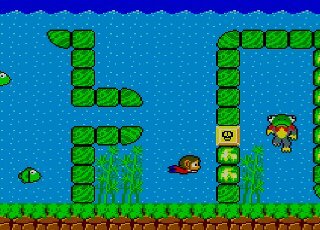 You’ve got to feel sorry for poor old Alex Kidd – once, a flagship mascot for Sega during the glory days of the Master System, the world was his oyster. Then, along came a certain Mr Hedgehog to grab the media attention and plaudits and young Alex was left by the wayside – neglected and forgotten, with only his bowl of rice and huge sideburns for company. Bless. Quite why I’m feeling bad for the pint-sized scamp is something of a mystery. 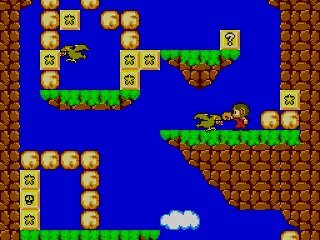 Very few games had me pulling my hair (not Alex-style sideburns, thankfully) out as much as his particularly colourful romps – the very worst culprit being the Miracle World instalment. Equipped with fists of steel and ears of Spock, Alex must toddle along (or swim in some segments) sixteen levels of platform style tomfoolery – deciphering puzzles, smashing through walls and destroying weird-looking folk along the way. Ah, yes, it’s a traditional fare platformer alright, but Sega know the genre like the back of its hand and a super little game hides underneath it all. The Ogre crippled me a few times over the years. But now, to the hair pulling – boss battles are won not by judgement, skill and finely-tuned reflexes but by sheer luck via the form of a rock/paper/scissors game. Win two out of the three contests and it’s a victorious move onto the next stage, lose and you’re shoved back to the start of the level. Now call me a nit-picker, but isn’t that a little unfair? This game alone improved my swearing vocabulary by some 500% (and I was only ten when it came out) – it’s amazing how creative one can be with the English language when forced to swim through another level of vein-popping trickiness because some weirdo has pointed a pair of animated scissors at you. C’mon Sega, what did we do to you? But, despite this, you keep on coming back for more due to the irresistible charm of it all. Yes, Alex may look like he’s just ‘dropped an E’, be wearing those dungarees with a little too much enjoyment, and annoy you with his dinner eating after each successful level (eating rice with chopsticks? smug little git) but he’s running around a little Miracle World that’s so adorable you can’t help but have another go. And another. And another.